Outdoor Garden Umbrella, the term itself clarifies the purpose and its use. 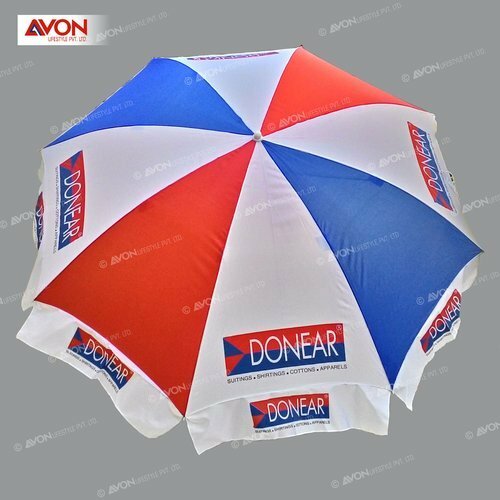 As any company has its roots firm on few of its products amongst the product line it manufactures, Avon Group feels proud, as being recognized as a good quality Outdoor Garden Umbrella manufacturer in Mumbai.outdoor Garden umbrellas are also called as road side umbrella, beach umbrella, street umbrella radio Mirchi umbrella, 98.3 FM umbrella, big umbrella, hotel umbrella. Garden umbrellas are used for all kinds of company promotions, road shows, outdoor promotional activity, and roadside activity. Garden umbrellas are made of superior quality raw materials. Outdoor Garden umbrellas are cost effective an opted by corporate sector for product promotion or sales promotion activity. Packaging Details our standard packing 50 Pics and Garden umbrella packing 10 pics can be altered on request.